A highlight of the holiday season are the sites and decor which come to life with the spirit of the Christmas holiday. Christmas lights across the world collectively are being turned on accompanied by the opening of Christmas markets and seasonal gift stores. Like in other countries of southern Europe such as Portugal and Italy, the nativity scene is of a great importance in Spain, as Christianity is the most common religion. 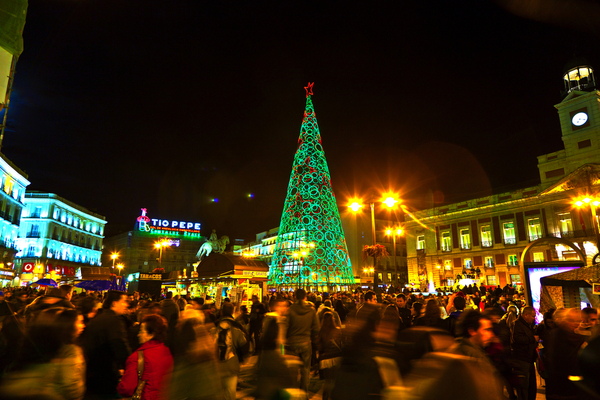 The city of Madrid with no exception partakes in some of the most festive times of the season. 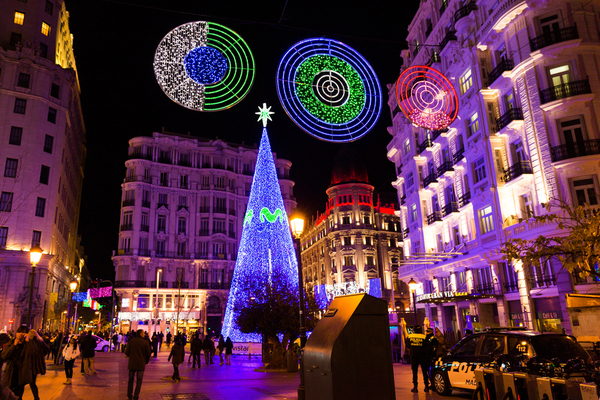 Here we overview the top things to do during the Christmas holiday in Madrid, Spain. 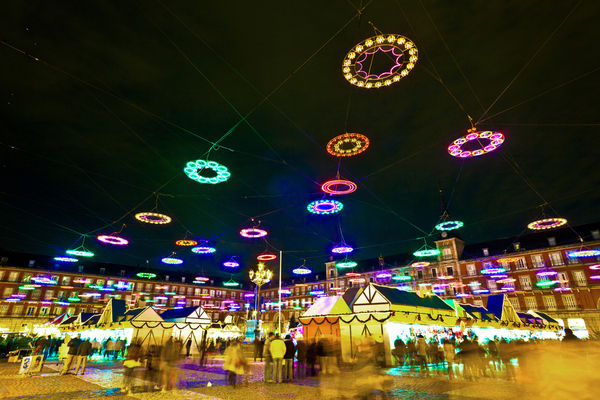 The most known Christmas market in Madrid is the one at Plaza Mayor. Here you can get figurines for your nativity scene, a Christmas tree, and all its decorations. On some of the main squares, you can find ice-skating rinks, hot chocolate, and other winter activities. This year, a traditional highlight is the Christmas tree at Puerta del Sol which doesn’t resemble your traditional Christmas tree. This tree was designed by Spanish fashion designer Agatha Ruiz de la Prada and her approach and interpretation are rather contemporary. A big part of the Christmas traditions in Madrid is Cortylandia. The department store Corte Inglés de Preciados sets up this big Christmas scenario with singing puppets and figures at its main entrance. Each year there is a different theme and this year’s theme is dedicated to the character that is representative of the children’s segment of the store, Pitiflú. This display is the most visited spectacle during the holidays and children especially enjoy it. After the holiday feasts, there is also an opportunity to run off some pounds in a race that has won great significance over the years. On December 31st many people participate in the San Silvestre Vallecana, a 10km race that is open to everyone. However, with the growing popularity, there are now two different races: A fun run for amateurs and an elite race for more professional runners. If you do book a visit to Madrid for the Christmas holiday, be sure to stay until after January 5th to see the big parade. The parade is in honor of the arrival of the 3 kings. Another exclusive feature of the Christmas season is the food. With traditional meals for main courses, you will also find an assortment of sweets that are special for this time of year. Typical holiday treats include roscón de Reyes, and turrón or polvorones. There are also many Christmas candies similar to the ones you may find at home, however just a little different which is exciting to explore something traditional and new. With so many sites to see and places to go, you may be in a pickle trying to choose which city you would like to spend your next holiday in. We hope that the unique things the city of Madrid offers, you may consider as a future option. 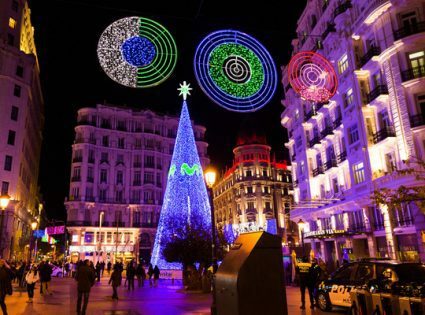 There really are so many things to do during the Christmas holiday in Madrid, Spain.